We all love gallery walls, and it's not hard to see why. They do so many things. They're an amazing way to infuse color and pattern into space. They let the art-lovers among us display our collections in groups so we can get more pieces on the walls. They're an excellent way to take up empty space on a large wall, making the room feel fully inhabited. And most importantly they're one of the best opportunities we get to show who we are and what we love in our spaces. Gallery walls are simply the best. But if you're starting to feel like you've seen so many that you haven't started on your own for fear of looking too conventional, then let me be the first to invite you to be unconventional. A great gallery wall can be just pictures, whether art or photos. It can also be much more than that. To make a great gallery wall, start with your favorite images like photographs, drawings, or art, and then start adding in the things you cherish like postcards from favorite vacations, your grandmother’s dishes, jewelry, or pieces from your favorite game. The possibilities are essentially endless. Of course, you still have to keep it stylish. But with some practice and a keen editorial eye, creating an eclectic and chic gallery wall is no trouble at all. 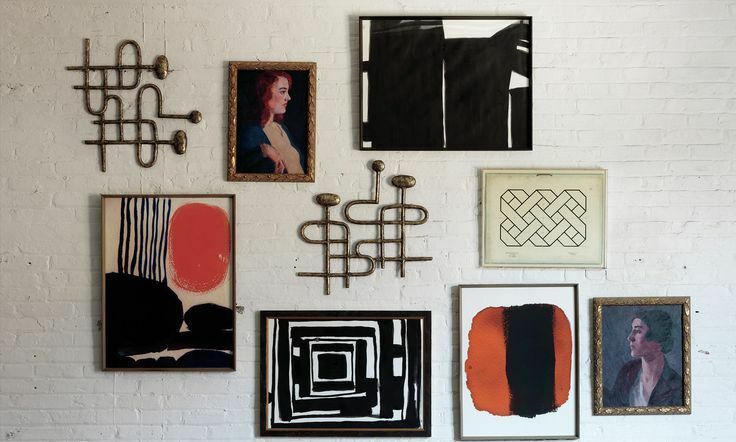 Check out these 6 unique gallery walls that go beyond the standard framed images to make a major design statement. Color plays a key role in almost every aspect of design. So when taking your gallery wall to the next level, think of color first as it will most likely be the main line that ties all of your different elements together. On this wall, the Cameroonian Juju hat picks up the hot pink tone from the main art pieces while the mirror adds a second warm metallic frame to the collection. The slippers pick up some of the lighter pink shades present in the art as well as being just a really cute idea. Displays that have a central concept always look a bit tighter and more put together than those that don't. This gallery wall would be great for a foyer, a dining room, or any place where you’re looking to add a layer of sophistication. Unlike the first wall, this one sticks with a fairly neutral color palette, but it’s the variety of objects that really attracts attention. The animal motif is expressed in both the pencil sketch of the elephant and the large metallic knocker. The two combine with the small wooden piece to give an unmistakable feeling of the outdoors. We especially like how the animal and plant elements are subtly repeated on the console table below the gallery wall, making the entire space look very polished. The two unique mirrors are beautiful additions and have the added benefit of making the space appear larger while reflecting natural light and adding a warm metallic to create a textural contrast with the warm wood tones of some of the other pieces. This is a fantastic example of how you can mix textures, materials, and objects to create a gallery wall that makes a really unique style statement. Just like every piece on your wall doesn't have to be an image, every part of your gallery doesn't have to be on your wall. If you place a gallery wall behind a credenza or entertainment center, use the surface as part of your display. In this space, some of the pieces on the wall are so low that they appear to be on the mantle, and some of the pieces on the mantle are tall enough that they look like they might be on the wall. Playing with levels in this way creates wonderful moments like the tall statue of the ballerina on the right side of the mantle that's flanked strikingly at the top by two paintings on the wall, and at the bottom of one wall-hung piece and one that's sitting on the mantle. This is another excellent and unexpected way to build layers into your design and add depth to your room–definitely something to try at home. There will always be a few things that you need to have in your home décor that wouldn't be in a magazine shoot. In that category, televisions, cable boxes and wires are among the first things that spring to mind. But by building a gallery wall around it, even your television can look like it's ready for the front page. The thing to love about eclectic gallery walls like this is that there is a variety of dimensions, everything isn’t just flat against the wall. Here, sconces with candles and small vases, and small floating shelves with keepsakes help to add a 3-D element while making the space reflect a more personal style. When creating a gallery around a television, the non-image pieces serve as a means to fit the television in as just another element. Consider mixing more rustic elements like unfinished wooden frames, old mirrors, or pressed flowers to balance the modern feel of the television. The simple colors of rustic pieces will also help to keep the impact of the design under control. In this room, there is a large variety of items on the wall, but the neutral wall color and simple frame colors keep the space from looking too busy. Like any design project, gallery walls are in danger of spinning out of control if they're not watched over by an editorial eye. At the same time, going too tame leaves you with something visually uninspiring. Adding in non-traditional pieces can make it even harder to strike just the right note, but it's also what makes it so amazing when it all works out. The key is in finding the places where you can be consistent and using that to connect all of your disparate pieces. Take this wall for example. We notice something new every time we look at this wall. Did you spot the butterflies, the antique mirrors, the historic photos, the lithographs? There is so much happening on this wall, but the simple white backdrop and consistent black framing with white matting make every piece feel very deliberate and the entire wall, well organized. The mixed mediums create a great layered sense of texture on the wall, and we love that the gallery is floor-to-ceiling and incorporates the furniture so it flows seamlessly with the room. Last tip for a room like this? You'll want to pull out a level for this one. Making sure that every frame is perfectly straight is crucial to providing a sense of structure. Look closely at this wall? What do you see? Not a single one of these pieces is a painting or a photo. In fact, they are all serving platters. Who can turn down a great deal on a beautiful, unique serving dish, a ring bowl, or mismatched vintage china? We can’t! Unfortunately, unless you are entertaining very often, most of those beautiful pieces rarely see the light beyond the cupboards. But they can create a truly memorable gallery wall. We like that this gallery wall is in the bathroom for two reasons: First, the bathroom is often sorely neglected when it comes to design; and second, there’s not a lot of gregarious activity in the bathroom (think: impromptu kitchen dance party) that would make a gallery wall made of breakables especially vulnerable. But what we like most is that this is a truly creative use of unusual pieces in a space where you don't usually see gallery walls. When planning your next wall-based masterpiece, look for opportunities to think outside the box. You'll be amazed by what you come up with.